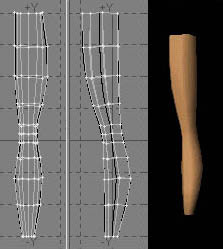 In this tutorial i going to tell you how to make low-res leg in LightWave 3D. This tutorial require basic navigation/selection skills with LightWave Modeler. Although i tried to show all "moves". Indeed it's not really tutorial, it's a tip rather. Using this tecnique you can create almost all parts of avatar. There're two main ways to create parts of avatar. First one is making primitive shapes like cylinders, balls and tweak them with Magnet and Drag Net tools. Second one is using splines for rail extrusion and spline modeling. My opinion is that second way gives you more control, works faster and makes more accurate joints. Before you start, you have to adjust your "Data Options" and "Surface". To do that, make sure that "Caps Lock" is turned off and press "O" button (Objects|Options). Press "Quadrangles" button and "Okey" then. Now LightWave will generate Quads only. 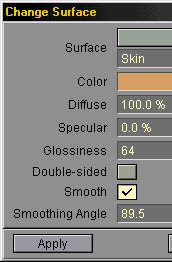 Press "Q" button, select "skin-like" color, check "Smooth" checkbox, press "Apply". First thing we have to do it's rail splines. Select "Points" selection mode (Ctrl+Shift+G). Press "+" key on keypad (Polygons|Points) Now, using right mouse button put six points on "Face" view as shown on the pic. 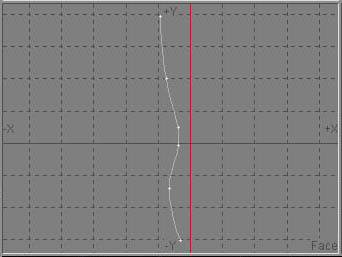 Do it "from bottom to top" direction, it's important note, direction of spline has meaning. Press Ctrl+P (Tools|Make) to make spline. 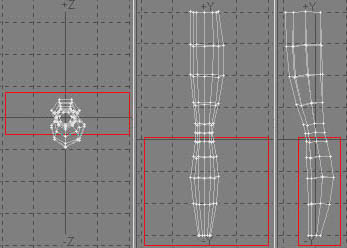 Now we need to "mirror" our spline, to do that press Shift+V (Multiply|Mirror) to select "Mirror" tool. 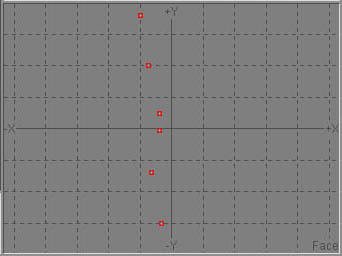 Click in the "Face" view and make axis appear as vertical line, then press "Enter" or right click mouse. 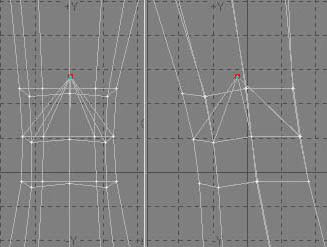 Now we have 2 symmetrical splines lying in the frontal plane, we need to create anoter two splines in a "side" plane. Easiest way to do that is copying and rotating existing ones. Select "Poligons" selection mode (Ctrl+Shift+H). Add second spline to selection using Shift key. Press "C" (Copy) then "V" (Paste). Go to the top view, point cursor between splines and press "R" key (rotate 90 degrees). 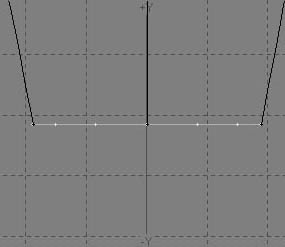 Okey, now we have all splines what we need. We need to shape them as leg. Select "Points" selection mode again (Ctrl+Shift+G). 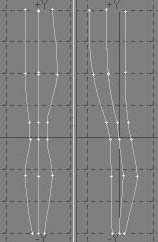 Press Ctrl+T (Modify|Drag) and move points to make contours look like a leg. Now we going to make actual leg. Press "X" to cut them of first layer then press 2-key on keyboard not keypad (to make second layer active) and press "V" to paste them. Now press 1 key to make first layer active, then press Alt+2 to make second layer visible and active as "Background". Now we have to create polygon we will extrude along rails. I think best choice is 7 points polygon, but you can use more or less points one. Matter is "Smooth/polygon count" rate. Select Disc tool (Objects|Disc), draw small disk on the top view, then press "n" key to call "Numeric" options (Objects|Numeric), type 7 in "Sides" field, press "Ok" then press Enter or right mouse click. Press "T" key (Modify|Move) and move this disc to the base of the leg (bottom). Press Shift+A (Display|Fit Sel) to Zoom Selection (our disc). Now we have to adjust size of the disc to fit splines. We will use Move (T) and Stretch (H) tools for that. So move it and adjust width of the disk with Stretch tool (H key) in Front and Left views. When done press "A" key (Display|Fit) to view whole thing. Press Ctrl+Shift+R (Multiply|Rail Extr), select "Knots" and "Uniform" in dialog. Type 10 in the field near "Uniform" button. What does it mean? Uniform allows you type number of subdivisions what you want, Knots makes LW allocate subdivisions according to knots on rails, usually it makes shape more accurate, well, better one time to see then few times to read, so just try them both (use "U" key to undo). Well, press "OK" and we have our leg almost done :) If for some reason you have all polygons flipped, just press "F" key (Polygons|Flip) to flip them all. If you aren't satisfied with shape you got, just press "U" to undo, go to second layer (2 key), adjust splines with Drag tool (Ctrl+T), then repeat Rail Extrusion again. If you look on preview you see that we got two 7-points polygons on top and bottom of the leg shape. We need to delete them, as far as they won't render with RenderWare anyway. To do that select "Poligons" selection mode, press "W" key, press small "+" button near ">4 Vertices" field to select them then press "Delete key". Close "Polygon statistics" window. Now we have to make joins, i.e. separate leg on two parts. press button to make it read "Include" . 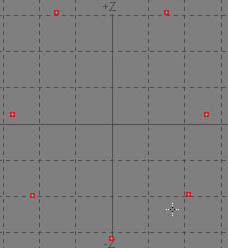 Draw rectange around lower joint as shown on the pic then press "X" (Cut) key, then "V" key (Paste). Now we have them separated. Now we need to create "hinge-like" heads for joints. Let's do it. Select any polygon(s) on "Upper leg" joint, press "]" (Display|Sel Conn) key to select all connected polygons, then press "-" key on keyboard (Display|Hide Sel) to hide selection. Now only "Lower leg" joint left on the screen. Select "Include" selection mode, Draw rectangle around "lower leg" joint as shown on the pic, you need to leave points on the top of joint out of rectangle. Press "-" key again. Now only seven point left on the screen. Press "A" (Display|Fit) to fit. Select "Points" selection mode (Ctrl+Shift+G). Go to "Top" view and select points with clockwise direction (use Shift or just press and hold mouse button while selecting) Go to "Tools" tab, press "Custom" button and select LW_PointExtender, now press "T" key and move points up a bit, then press Ctrl+Shift+W (Tools|Weld) to merge them, now press "\" key (Display|Unhide) to show all thing hided before, press "T" key (Modify|Move) and adjust position of that "welded" point, press "A" key to fit. Okey, we have "lower leg" joint done. Do same with "upper leg" joint. I hope it will help you a bit.